No Incinerator 4 Horsham (Ni4H) is a peaceful, non-political Community Group of local residents, formed in 2016 to raise awareness and campaign for sound environmental reasons against plans to build a huge incinerator in Horsham, importing up to 230,000 tonnes per year of residual commercial and industrial waste and/or residual municipal solid waste from across 6 counties. The proposed building is 36-metre-high, and the 95-metre-high permanently lit chimney stack is higher than the Statue of Liberty. The Group’s current focus is on the planning appeal lodged by Britaniacrest Recycling Ltd against refusal of planning permission by West Sussex County Council (WSCC). Ni4H took over from a previous campaign group (HALT) which successfully fought an incinerator proposal in the early 2000s. As a result of that refusal of planning permission, WSCC and West Sussex taxpayers made a significant investment in alternative waste management solutions and built a Mechanical & Biological Treatment facility (MBT) at the Brookhurst Wood site. The new facility provided West Sussex with significant additional waste processing capacity of over 310,000 tonnes per annum. Members of Ni4H have spent many hours reviewing evidence in the public domain to try to understand the need for waste management capacity in the locality, available and alternative technologies and alternatives to incineration. They have also examined, in detail, the WSCC and South Downs National Park Authority West Sussex Waste Local Plan April 2014 and Britaniacrest’s supporting development documents, attended public meetings, and provided representatives to the Residents’ Liaison Group for Britaniacrest. Ni4H has engaged with members of the public organising two petitions, holding public meetings and through the media and social media. 4,532 members of the public who signed Ni4H’s Change.org petition at planning application stage, and over 1,410 members of the public (so far) who signed Ni4H’s new petition at planning appeal stage, feel very strongly that this planning appeal should be dismissed. The new petition started 27th January 2019, signatures up to 9th April 2019 were 425 on paper copies and 985 online petition with Change.org, totaling 1,410 signatures. Ni4H has kept up to date with a changing view in the Government to move away from residual waste management to a focus on increasing resource productivity through measures to avoid the residual waste streams altogether, as set out in the 2017 Government Office for Science Report “From Waste to Resource Productivity”, and Defra’s “Our Waste, Our Resources: A Strategy for England” published at the end of 2018. The latter document sets very clear pathways and drivers to secure change and to tackle specific problematic waste streams e.g. plastic and food waste. Ni4H appreciates there is a pressing need to manage waste as high up the waste hierarchy as possible, in the top tiers, and is concerned that this could be undermined by overprovision of new waste treatment capacity at the lower tiers of the waste hierarchy. 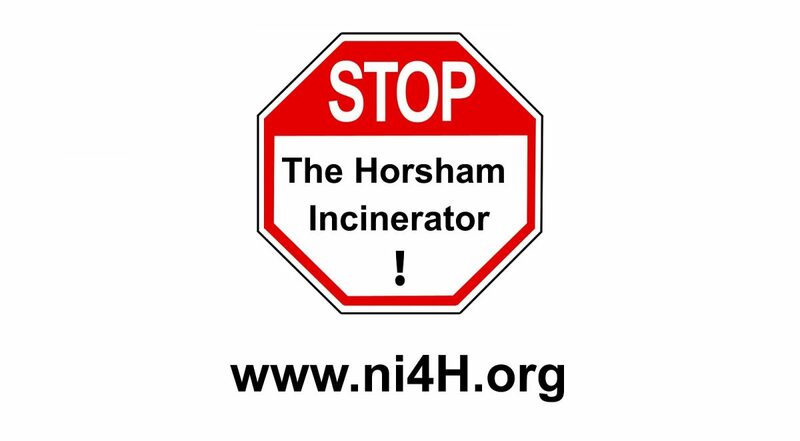 Ni4H strongly believes that the Appeal against refusal of a “3Rs facility” in Horsham should be treated as nothing other than a proposal for an incinerator (bottom of the Waste Hierarchy) which fails to meet key Local, County and National objectives, policy, and guidance. Local residents need professional assistance and urgently need to raise £50,000 for technical expert reports and a barrister, to take forward Ni4H’s 31 page Interested Party submission and represent Ni4H as a Rule 6 Party, at the 3-week Public Inquiry due to commence on 29th October 2019. If sufficient funds are not raised Ni4H will only be able to speak for a few minutes at the Inquiry.